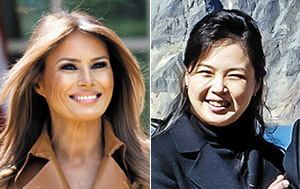 Will Trump, Kim Bring Their 1st Ladies? Among the speculation swirling around the upcoming second summit between U.S. President Donald Trump and North Korean leader Kim Jong-un is the question whether they will bring their wives this time. At their first summit in Singapore on June 12 last year, neither Melania Trump, who famously does not relish her public role, nor Ri Sol-ju, who does, was present. Melania stayed behind because she had just had kidney surgery. There has been no official announcement, but a diplomatic source speculated that they will likely accompany their husbands to Hanoi this time, given that the upcoming summit will take two days while the first one only took a few hours. Kim is staying even longer since he will arrive first for a state visit to Vietnam. Ri also accompanied her husband to the first inter-Korean summit in the border truce village of Panmunjom in April last year, and to China twice last year and once this year.